This family lost their little boy, and as they mourned his death, they had what some are saying was a divine blessing of comfort while at his funeral. Some say, he wanted his Mother to know, all is well, and they will see each other again one day…through a balloon that seemed to comfort his family. 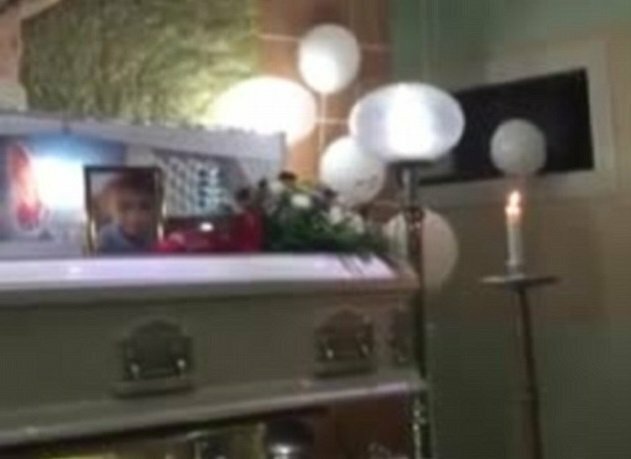 Two videos released by grieving mother Joy Ganda Vibar-Alamares, from The Philippines, after her son Trebby’s wake show helium balloons gravitating from behind the coffin to those grieving. The family say they believe that the balloons were being moved by the spirit of the deceased seven-year-old, with Ms Vibar-Alamares writing on Facebook ‘I would like to believe that this was his last mission’. The first video, which has attracted more than 3.5 million views, shows a white coffin covered with flowers and white balloons, and featuring a portrait of the dead child. One of the balloons then begins floating toward the pews in the chapel, in Legazpi City, Albay, before one of Trebby’s siblings alerts Ms Vibar-Alamares that the object is coming her way. Ms Vibar-Alamares, who is crying softly, then looks up at the balloon as it floats gently into her hand, nudges her head then begins to float away. But as the woman’s crying intensifies the balloon appears to change direction suddenly, moving closely behind her and bumping into her as she grieves. She begins to talk to the balloon and embraces it as it floats in front of her face. She sobs loudly and looks down before letting the balloon go, but it continues to float near her for a few moments until she places the string on the seat beside her and it floats away. That video has had more than 69,000 shares and 22,000 comments of support since it was uploaded on November 2 last year. The social media users commenting on the video seem to believe the balloon’s movement is the work of the boy’s spirit. God bless this family with comfort, and peace.